The Michigan-based harmonica player and singer Hank Mowery is no newcomer, having fronted his own band The Hawktones and toured with Mike Morgan & The Crawl during the 1990s. But it was not until last year that he would record his first solo project. While Account To Me is intended in large part as a tribute to the greatly missed Gary Primich, by featuring five of his songs, including two previously unrecorded, it will also function for many as an introduction to Mowery’s estimable skills as a performer and bandleader. The Primich songs alone offer a broad and varied stylistic palette. Perhaps the most straightforward of these, musically, is “My Home,” a hard, Texas shuffle driven by John Large’s relaxed yet insistent drumming. The liltingly melodic “Tricky Game” is clever without being precious, weaving references to Einstein and calculus into a romantic lyric. The groove and Chris Corey’s steel-drum-inspired piano suggest a lost Professor Longhair number. The uptempo cut “Put The Hammer Down,” with its creative and strong unamplified harmonica solo, is built up from the wild guitar figure Troy Amaro plays, one that could have been lifted from the Junior Watson playbook. Mowery’s smooth vocal and Amaro’s solo in “Pray For A Cloudy Day” have enough sophistication to move this Primich number into the urbane, jazzy territory of an artist like Lynwood Slim. Finally, the title song is a sweetly hushed, R&B ballad that could have come from Chuck Willis or even Buddy Holly. Bassist Patrick Recob contributes acoustic guitar, Mowery blows plaintive harmonica, and Amaro softens his tremolo-washed electric guitar lines further with whammy-bar shimmer. The balance of the set widens the scope considerably. Rev. Robert Wilkins’s “That Ain’t No Way To Get Along,” familiar through his own recording and the Rolling Stones’ adaptation “Prodigal Son,” goes back to the prewar years. In keeping with its country blues origins, it is performed in a duo setting, with Mowery accompanying the National resonator guitar of singer Jimmie Stagger. Interplay between Mowery’s harmonica and Corey’s wonderfully cheesy, Space Age-toned B3 highlights the rocking R&B/Latin-flavored instrumental “Banana Oil,” originally by Memphis Slim. 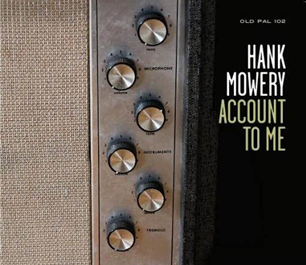 Mowery contributes the deep and lowdown “If I Knew What I Know,” a slow blues drawn directly from the Muddy Waters well, and sparked by fine ensemble playing and fat amplified harp. “Spend A Little Time,” a Mowery/Recob collaboration, opens with a drum fill quoting “Keep A Knockin’” (and “Rock And Roll”) before veering off into another direction, developing into a Gulf Coast rocker worthy of The Fabulous Thunderbirds or Primich, arranged to lean heavily on the hard-working rhythm section, acoustic piano, and a funky, fuzz-toned Wurlitzer that fills the guitar’s spot in the mix. Recob sings his own composition “Target,” a haunting blues lope in a minor key that evokes a dream jam session between Little Walter and Grant Green. The musicians and producer-engineer Tommy Schichtel clearly paid close attention to making and capturing incredible sounds: tones this good don’t happen by accident. Mowery and crew play expressively and with subtlety, never pressing. That unforced feel extends to the arrangements; the songs seem to go where artistry and imagination, rather than any particular stylistic preconception, have led them. Finally, Tad Robinson’s perceptive liner notes articulate the record’s origins and achievement with intelligence and grace. Account To Me, a beautiful and remarkable work, is bound to make a lasting impression. I received the review copy of this CD from Mark Pucci Media.